Al Maryah Central ... due to open by 2018-end. More than 76 per cent of the work has been completed on the $1-billion Al Maryah Central coming up in Abu Dhabi and the retail venture is on track for opening by the end of 2018, according to its developer, the UAE-based Gulf Capital. Located at Al Maryah Island, the project is a joint venture project between Gulf Capital and the US-based Related Company and is progressing well, on track and on budget, reported the Gulf News, citing Gulf Capital’s top official. “The construction will finish in September next year and we need a bit of time for getting approvals from the regulatory and governmental bodies before we open the mall,” stated CEO Dr Karim Al Solh. The 2.8-million-sq-ft mall will feature the first Macy’s outside of the US, the first Bloomingdale’s in Abu Dhabi and 20 specialist Al Tayer stores as part of the 400-store retail offering. In addition, Al Maryah Central will include 100 restaurants and cafés, a 21-screen Vox Cinema with Imax and a host of other attractions. According to Al Solh, the mall will have a mix of entertainment and dining facilities that will drive a lot of traffic. “About 20 per cent of the mall will have food and beverage components and 10 per cent entertainment. Apart from this, we are bringing a number of new brands to the region. 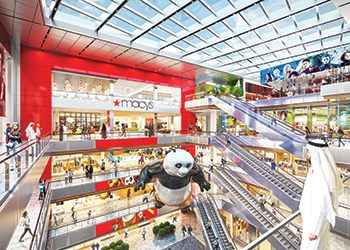 This will be a unique mall on par with what you see in the US or Europe,” explained Al Solh. Al Solh said 50 per cent of the retail space is already leased with a number of new potential customers showing interest. “We are expecting 70 per cent of the mall to be leased by the end of this year,” he told the Gulf News. The new shopping mall will be linked to the adjacent property, The Galleria Mall, which opened in 2013 and was also developed by Gulf Related, said Al Solh. On its regional projects, the CEO said its residential project in Saudi Arabia will be built in phases due to the slowdown in the economy. The firm is building 520 units including villas, townhouses, and apartments. According to Solh, the SR1-billion ($266 million) project is slightly delayed. “We are bit cautious and are delivering in phases rather than in one shot. We will deliver apartments first, followed by villas,” he added.